Have you heard of the It's On Us or HeForShe campaigns? This year, White House and the United Nations both launched publicity campaigns aimed at encouraging men and women to support gender equality and end sexual assault. These campaigns are being discussed on college campuses but not in the working or professional world where issues of concern often arise. Why is this? How does one measure effectiveness of such efforts? Are there lessons for CSWA and others? The first reason for the lack of conversation about these campaigns may be lack of awareness. The White House It's On Us campaign to stop sexual assault hasn't been mentioned in this blog. The UN Women HeForShe campaign did get a brief mention in the September 26 AASWomen Newsletter along with a link to the launch address by actress Emma Watson, shown above. But I suspect that, like me, most readers and most professionals, unless they are in an organization whose leadership has been informed and decided to participate, would have little reason to pay attention. The second reason may be a lack of relevance. This seems unlikely, given the focus of these campaigns on ending sexual violence, sexual harassment, pay inequity, and discrimination in many forms. Some may feel the campaigns are only relevant for college campuses, and indeed It's On us is directed to colleges, however partner organizations include AAUW and many companies in addition to many universities. HeForShe deals directly with the issues of relevance to CSWA. Both campaigns have excellent educational materials, brief and to the point. The third reason may be discomfort with the marketing. "It's On Us to end sexual assault" may seem off-putting to some. HeForShe may seem divisive or patronizing to some. I'm very interested in reader views of these issues, as many of us are trying to reach those who are not already listening, or who may feel unwelcome to participate in efforts to promote social justice and equality in matters of gender, race, and privilege. One more reason there may be so little discussion of these campaigns is a possible lack of effectiveness. What does effectiveness mean and how is it measured? Both campaigns aim to increase awareness of problems, so measuring engagement aligns with their goals. For example, the UN Women campaign measures are based on enrollment numbers (those who take the pledge) and numbers of events held or new stories produced by sponsoring organizations. However, awareness of a problem is not the same as owning up to and solving the problem. So the campaigns may be effective by the wrong measures. Many of us want to increase awareness of social justice and equity problems, to do relevant work to solve the problems, to engage others with effective communication, and to know that our efforts are making a difference. Successful change movements often start from the grass roots level, not top-down like the two campaigns discussed here. Yet I believe it's crucial that leadership in all areas - governments, companies, universities - be committed to, and learn to be effective at, promoting equality and justice throughout their organizations. Do large-scale campaigns help? What about medium-scale efforts like this blog and the efforts by CSWA and similar organizations? Reader feedback would be greatly appreciated. 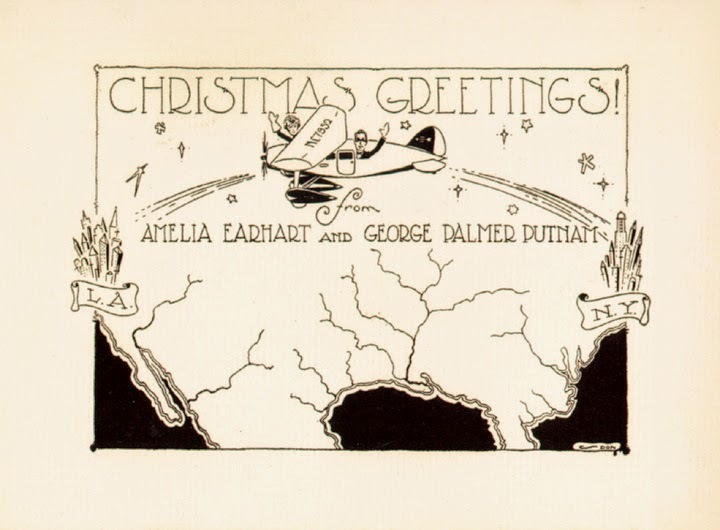 I recently ran across the Christmas card below from Amelia Earhart which got me interested in the remarkable story of this woman persevering against the pressures of her time. Earhart spent her life pursuing her passion for flying and pushing the envelop in aviation. Her motivation was to expand the capabilities of planes, not just of what women could do, and she had to conquer bias at every turn. Earhart was born in 1897 and took her first plane ride at the age of 23. She immediately became hooked and worked various odd jobs to save money for lessons with pioneering female aviator Anita Snook. She spent every minute of her free time learning about planes and flying. Within 3 years she had her own plane, international pilot's license (16 woman to have one) and set an altitude record (14,000 ft) for a female aviator. In 1928, a year after Lindberg's transatlantic flight, she was asked to join a team with two men with the purpose of her becoming the first woman to cross the Atlantic. They flew that year and she gained fame from the accomplishment. However, she wasn't satisfied since a man did the flying and she was only a co-pilot. She later complained that she "was just baggage, like a sack of potatoes". That was never to happen again. 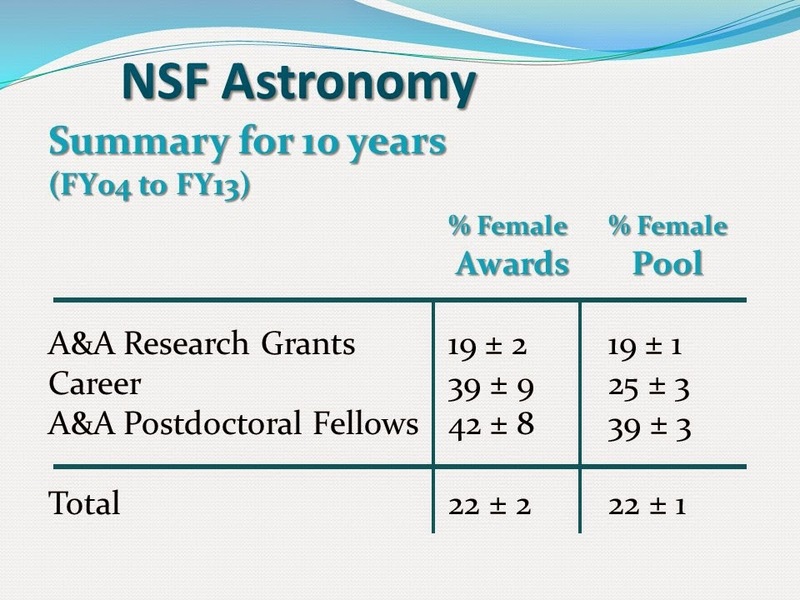 During my first year as a Program Officer in NSF’s Astronomy Division, I was able to compile data on the success rates of different opportunities in the Individual Investigator Programs. As chair of CSWA, one of my top priorities was to look for gender differences. The results* for Astronomy are summarized in the table. The top line is for the Astronomy and Astrophysics Research Grants (AAG), our main grant program. PIs are mainly (but not exclusively) senior and mid-career scientists. There is both good news and bad news here. The good news is that the percentage of female awards (19 +/- 2%) is equal to the percentage of females in the pool (19 +/- 1%). The bad news is that the percentage of women in astronomy at the senior and mid-career levels is still so low. The next line in the table is for Faculty Early Career Development, the CAREER program, which generally makes less than 10 awards per year. 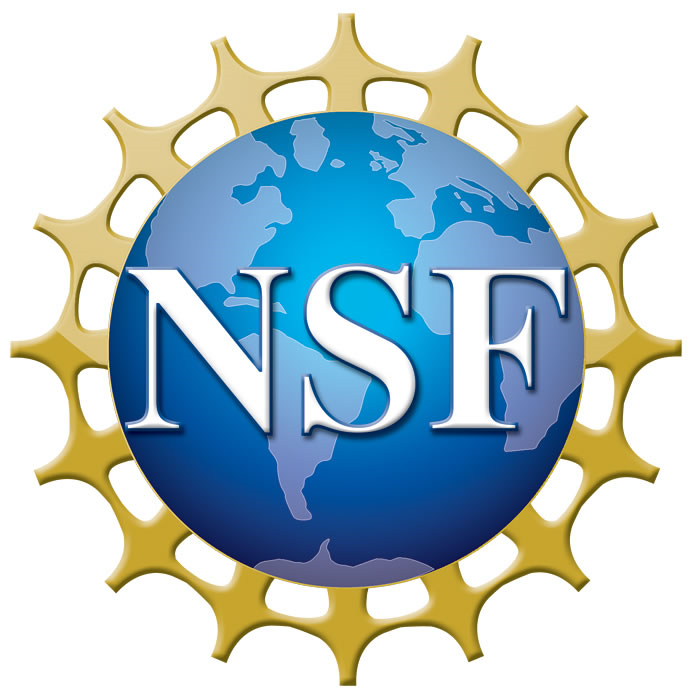 The following line is for the NSF Astronomy and Astrophysics Postdoctoral Fellowships (AAPF), which currently makes 9 awards per year. Although the numbers are smaller and the uncertainties are larger, the results for both of these programs agree with those of the AAG. If we do weighted averages of all three programs, we again find that the percentage of female awards (22 +/- 2%) is equal to the percentage of females in the pool (22 +/- 1%). 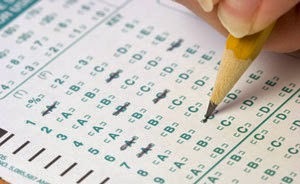 Which Grad Program Will Be The First To Drop the GRE? This year I am the chair of the admissions committee for the Harvard PhD in Astronomy and Astrophysics. Around the country, committees such as ours are setting to work to select the incoming class. I thought it timely to share some worries I have been having about one required element of our application: the Graduate Record Examinations (GRE) General Test, and the Subject Test in Physics. First, I worry that the GRE doesn't actually measure the thing we really care about, namely the applicant's likelihood of success at creative and demanding research in astrophysics. So far, my search for such evidence has turned up empty: I can't find a persuasive study showing that the GRE Physics or General test scores provide a key measure of future research success. Yes, the scores do correlate with performance in graduate coursework, but to be honest I don't really care about that as an end in itself. If a student working with me finds Earth2.0, I am prepared to overlook a B- in one of our survey courses. And this isn't just my opinion: When is the last time the Hubble fellowship committee asked to see your transcript? Today's guest post is by Brooke Simmons, an astronomy postdoc at Oxford and the Henry Skynner Junior Research Fellow at Balliol College. Brooke researches the co-evolution of black holes and galaxies and is actively involved in citizen science within the Zooniverse, including Galaxy Zoo and other projects. Last week I was at the .Astronomy meeting at the Adler Planetarium in Chicago. .Astro ("dot astro") is less a meeting about any specific science and more a meeting about being a scientist, and using the internet to do and communicate science. It's also more than that, and partly its structure is what makes it hard to define: about half of it is an unconference whose agenda is set on the fly by the participants. This choose-your-own-adventure meeting means that each .Astro is different, but it also means that a single .Astro is different for each person there. It was the sixth "dot astro" meeting (the first was in 2008), and it was my third time attending. It's my favorite conference in my schedule, and I spent some time this year observing the event itself and others' reactions to it. One of the things I was curious about was whether the expectations, experiences and reactions of first-time participants were different for different genders. Nowadays I find that a lot of my friends and colleagues have heard of .Astro, but they have wildly different ideas of what it is. I've heard "that's a meeting for astro coders, right?" and "that's a meeting about outreach, right?" from people on either side of me at the same group lunch. The answer to both questions is yes, and more. Anecdotally, I noticed a lot of conformation to gender stereotypes when talking to people about .Astro, mainly because when I've spoken to women who thought it was just for coders they've also usually followed up by saying they didn't think the meeting was for them. Rob Simpson, the creator and organizer of .Astro, spends a lot of time thinking about how to make .Astro a more diverse place. Last year he wrote a series of blog posts about taking steps to ensure better gender equality for .Astro 5. The steps worked pretty well, and this year he took pre-emptive action, changing the application form to decrease the barrier that makes women less likely to attend conferences "for coders" and less likely to volunteer to give a talk. That worked pretty well too, though there's still work to be done. The gender balance for the whole conference was 40% female, 60% male, 0% other, which continues the positive trend from last year. Although there was still a relative lack of female speakers giving longer talks, that did improve for the lightning talks. However, one of the attendees noted during an unconference session that despite this progress we were still self-separating into standard biased roles: the unconference sessions about software and development skewed male and the outreach-oriented sessions skewed female. On the last day of .Astro I sent out a short survey to the participants. Just over half of them answered it (thanks all!) and I found the responses very interesting. First of all, the survey responses are overwhelmingly positive across the board. All of the (anonymous) responses either explicitly state they'd like to come to .Astro again or talk positively about what they'd like to see in future meetings. Two of the questions on the form were "What did you think .Astro was about when you applied to attend?" and "What do you think .Astro is about now?" Both returning and first-time attendees generally changed their answers between these questions, either to describe a complete change of outlook between pre-attendance and now, or to add a few extra words to the "now" question. Nobody mentioned they had expected the meeting to be primarily about outreach, but a few people said they'd expected .Astro was about tech and programming for astronomy. A few representative responses are listed below. What did you think .Astro was about when you applied to attend? Learning about cool stuff people are doing at the intersection of astronomy, CS and education. Meeting cool, talented people. I knew it was about tech and astronomy. What do you think .Astro is about now? A meeting about hacking and so much more. And now I know what hacking is. Learning about cool stuff people are doing at the intersection of astronomy, CS and education. Meeting cool, talented people. Feeling like I've had a lobotomy because these guys seem to know all this stuff I've never heard of. I think it's about changing the field - of astronomy, but ultimately of science. I think it's about using technology, the internet specifically, to communicate, to learn, to visualize, to share science in a way previously impossible. Each of these answer sets are from women who had never been to .Astro before. It's no surprise to anyone who's paying attention that achieving gender balance in astronomy is a complex problem. .Astro is a unique conference where the organizers are very aware of how easy it is for the process of a conference to uphold gender stereotypes and have taken active steps to prevent it. Yet even though they've succeeded in achieving a gender balance of participants that's equal to or better than the balance of our field, there are still issues with encouraging women to give a talk, and women and men still self-select for more stereotypical roles. This in part means they still have different experiences of .Astro. One thing is clear, though: actively talking, strategizing and planning has made a dramatic difference in gender equality for this conference over the last 6 years. Given the .Astro philosophy and community, I have no doubt this active approach to diversity will continue and expand to improve .Astro's diversity among many other axes as well. .Astro is many things, but I think one of the underlying principles is a "yes, and" philosophy. If you're on board with that and you have ideas about how to do astronomy better, including how to make our field more welcoming to underrepresented groups of all kinds, please consider signing up for .Astro 7! 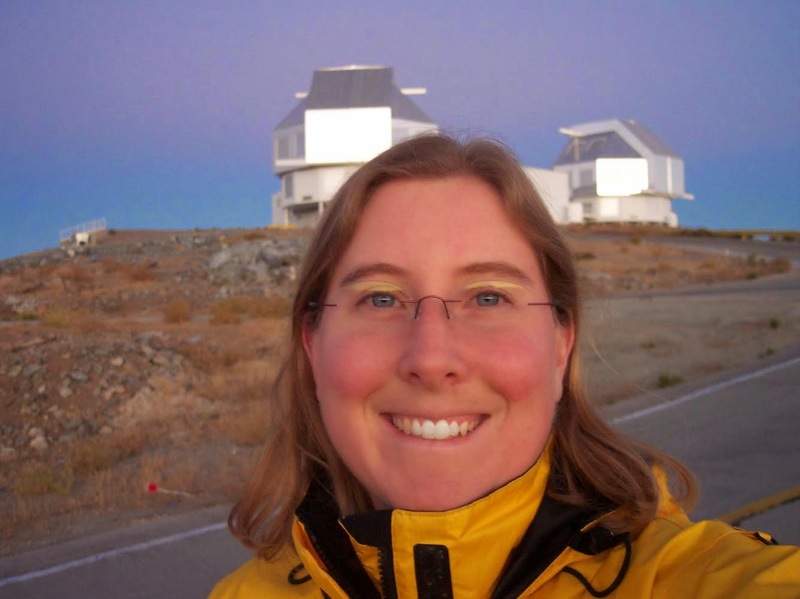 Today's guest post is by Jessica Mink, a positional astronomer and software developer at the Smithsonian Astrophysical Observatory, who has written the commonly used software packages WCSTools and RVSAO and worked on a variety of astronomical projects over 40 years. Much of her story is told in this interview with the American Astronomical Society's Working Group on LGBTIQ Equality (WGLE). While I consider myself to be a woman astronomer, I have not always been one. Since I made much of my reputation with a different gender expression and remain in the field, I have to accept the fact that I am also a transgender astronomer, and as a representative of that small group, serve as an ambassador to the rest of the astronomical world. While gradually (over 40 years!) transitioning from male to female, I have thought a lot about gender and its various facets, but when I volunteered to write a blog entry representing my gender minority for the Women in Astronomy blog, I realized that I hadn't been very systematic about it. It is likely that most readers don't have any trans* friends (that they know about), but this far into the 21st century, most thinking people are aware of our existence and might even know of one of us. With the holidays fast approaching, a common question that I see many of my colleagues struggling with is what to purchase our next generation of budding scientists for the holidays. A recent study featured in CBE-Life Sciences Education showed that family plays a vital role in initially attracting young people to the science, technology, engineeringand math (STEM) fields. As we look towards toy aisles, we are distracted by the massive aisle of pink for girls and robots, action figures, and toy weapons for boys, which have lead to many calling out the normalization of gender roles at very early ages that may also impact the career paths young girls take later in life. All of this leads to a dilemma for many of us with young girls in our lives to look outside of the standard pink aisle for gifts for those that have a genuine interest in the sciences. Legos, one of the greatest toys of all time, has stepped up several times and recently posted this great commercial for girls, which even focuses on the difference between how young children play (boys typically follow the design on the box, while girls tend to build from their imagination). Here are some shopping and blogging sites focused on science and empowering girls for my version of a 2014 Holiday gift guide (aside from Legos, found nationwide, and etsy, or as I call it, the online land for everything homemade). Some years ago, at a major US university, a visiting faculty candidate was told by a senior colleague – an influential, Nobel prize-winning director of a major institute at that university – that she would not be welcome to work with him, that he would not allocate his institute’s resources to her, and that his research group would be reluctant to talk to her because they were basically in competition with her. She wisely decided to build her career elsewhere, but not before describing the problem and leaking his email to others at the university. 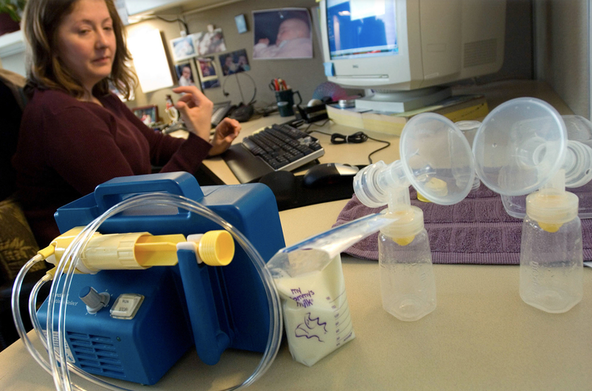 The ensuing scandal created a classic conflict between bad behavior and first-rate science. 5. It's Not Your Kids Holding Your Career Back. It's Your Husband. My Astroparticle Physics Laboratory at Goddard has 14 scientists, most of whom are physicists and 50% of whom are women. That is a high female fraction for a largely physics-oriented organization and I thought it would be useful to write today about how it came about. Goddard has good policies about diversity in the workplace. Here is the policy statement, known as the Business Case for Diversity at Goddard: "It is the policy of NASA's GSFC to develop and maintain a vital and effective workforce by involving employees in the creation of a work environment conducive to their best performance according to the Center's values and goals. Our objective is to foster an organizational climate where employee diversity and mutual respect are catalysts for creativity and team effectiveness." There are also strong policies at NASA against discrimination and bias, but I like the fact that the diversity statement is aimed toward performance and team effectiveness, and was developed as a business case. It is a good way to think about diversity and the best motivation for open hiring practices. The female fraction in the Astroparticle Physics Laboratory has increased over the past 15 years, a time period in which more women candidates became available to apply for openings. In all of our hires, the job was open to all candidates and selection was based on skills, publications, letters and interviews. Astronomy graduate students at the University of Illinois at Urbana-Champaign requested a departmental colloquium on diversity and inclusion, which I gave two weeks ago. Kudos to the department for agreeing to this and for advertising it widely, and to those who attended. The experience may be useful to others, so I share it here. The punchline first: the graduate students are disappointed at how little progress there has been in increasing faculty diversity. Even when proactive efforts are made by department leadership, change happens slowly at best. Increasing the representation by 50% or even 100% seems like a drop in the ocean given the small numbers of women in most astronomy and physics departments, especially if there are 0 or 1 women faculty in the department. Are we settling for permanent inequity if we talk about 25% women and not 50%? And what about other problems of underrepresentation and marginalization? These are the kinds of questions that can shift attitudes, including my own. Whereas I have taken pride in increasing the percentage of women in physics at MIT (for example, from 10% to 18% of the PhDs during my term as department head), I may be deluding myself that this is significant progress. Maybe it is, and maybe it is in the eye of the beholder. The point is to see things with fresh eyes, to think, and then to act. And no matter how much one has thought about such issues, there are always new perspectives that have the power to transform our understanding and engagement. This experience reminded me of a meeting I held with women graduate students almost 8 years ago as I sought advice on how I could help as a new department head. The students told me "You have to create a culture of caring in the department." They followed this instruction with crucial guidance: “We think you can make a difference, we expect you to make a difference, and we will help you.” I was being held accountable. If I wanted to succeed as a leader, I had to make this a priority. At UIUC I described some of the steps I took. I gave a primer on unconscious bias and an extract from the faculty search committee training that I do. I spoke about privilege and marginalization, and steps individuals and departments can take to equalize treatment. I made the business case for diversity and inclusion as a competitive advantage. In short, I did what CSWA bloggers do all the time. But I had many non-readers of this blog present in the room. Are such efforts a drop in the ocean? Obviously I think they make a difference, and I have data from my own institution to support that claim. But at a personal level, I work on these topics because of my personal ethics, and my recognition that my greatest impact will be achieved by enabling and empowering others to succeed. You're probably wondering why I titled the post "Hacking" and why I showed an old photo of the Hacker's Code of Ethics. Hacking refers to creative, collaborative effort to solve technical problems. Just as the meaning of “hacking” has evolved, “technical problems” can be extended to include factors that limit the success of many academic departments in technical fields such as privilege, unconscious bias, marginalization of out-group members, etc. Creative, collaborative effort to advance a respectful and caring community can leverage the power of diversity, improve student and faculty success, and enhance the quality of life for everyone. Doing so is the ethical thing to do. Reproduced from the June 2014 Issue of STATUS: A Report on Women in Astronomy. 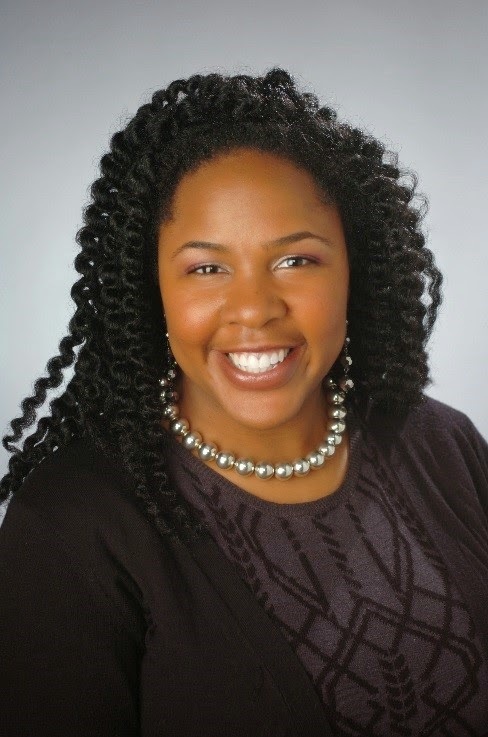 The article below is written by Dr. Jedidah Isler, Syracuse University, Department of Physics. Diversity and inclusion are important, yet vexing, issues that we struggle with in every arena. Academia and, more specifically, astronomy are not exempt. Many interpretations of the experiences of diverse people have been offered, but unfortunately, many have fallen short in pivotal ways. As an astrophysicist, I see the beauty and logic that physics allows us to impose on the cosmos, but also on a broader array of issues. Sociophysics, for example, “uses concepts from the physics of disordered matter to describe some aspects of social and political behavior.”  I would like, then, to describe a few diversity issues in terms of a physical concept that astronomers are familiar with, namely Planck’s Law. This analogy is not perfect, but it affords us a mechanism to address some of the complexity of diversity conversations and direct us towards more globally beneficial diversity practices. Even before I begin, I acknowledge that I cannot address all aspects of diversity, which includes the full spectrum of ethnicity, class and sexual expression. I focus on the diverse experiences of women (broadly defined), but these principles can generally be extended to other dimensions of diversity. Still, I encourage expansion of our colloquial definitions of diversity, even as social psychologists grapple with characterizing our behavior surrounding it. My goal is not to establish who suffers most, but to suggest that different groups suffer differently and in profoundly complicated ways. Thus, this article is for all of us. It is an attempt to provide a familiar framework for this complex issue. Most engineering faculty have highly developed 3-D spatial skills and may not understand that others can struggle with a topic they find so easy. Furthermore, they may not believe that spatial skills can be improved through practice, falsely believing that this particular skill is one that a person is either “born with” or not. They don’t understand that they probably developed these skills over many years. 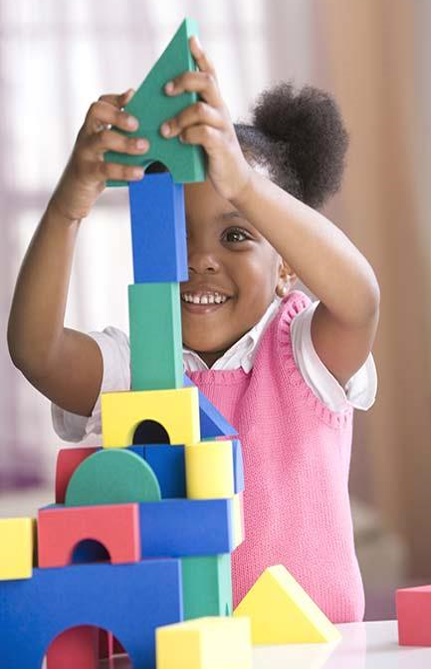 One of the most persistent gender gaps in cognitive skills is found in the area of spatial skills, specifically on measures of mental rotation, where researchers consistently find that men outscore women by a medium to large margin (Linn & Petersen, 1985; Voyer et al., 1995). While no definitive evidence proves that strong spatial abilities are required for achievement in STEM careers (Ceci et al., 2009), many people, including science and engineering professors, view them as important for success in fields like engineering and classes like organic chemistry. The National Academy of Sciences states that “spatial thinking is at the heart of many great discoveries in science, that it underpins many of the activities of the modern workforce, and that it pervades the everyday activities of modern life” (National Research Council, Committee on Support for Thinking Spatially, 2006, p.1). Sheryl Sorby, a professor of mechanical engineering and engineering mechanics at Michigan Technological University, has studied the role of spatial-skills training in the retention of female students in engineering since the early 1990s. She finds that individuals can dramatically improve their 3-D spatial-visualization skills within a short time with training, and female engineering students with poorly developed spatial skills who receive spatial visualization training are more likely to stay in engineering than are their peers who do not receive training. There have been many posts on this blog and elsewhere calling for increased diversity in astronomy. I've written about it. My student has written about it. Diversity has many benefits, and we're missing out on those benefits by not having a more diverse field of science. However, I'm becoming less and less enamored with diversity as a target or goal in and of itself. is particularly apropos to this discussion. If we only focus on diversity, we'll be like a CEO saying that her goal is to "make money." Ohhh-kay. But how, specifically? By what strategy and mechanisms will the CEO make money? It'd be like a coach of a sports team saying, "Our goal is to score more points than our opponents!" By what strategy? What offensive and defensive approach will you use? "Nope, we're just focused on scoring points!" Diversity is something we should strive for. But how will we get there? I contend that we'll only get to diversity by attacking the power structures that hold us back and stand in the way of diversity. For gender diversity, the roadblock is sexism. For racial diversity, the roadblock is racism. So rather than focusing on diversity as a target, we should instead aim at equal opportunity. Sexism and racism aim to deny equal opportunities to those outside of the white-male power structure. White women have made gains by directly attacking sexist power structures. But this process has left women of color behind. Gains for women (and men) of color will only be made once organizations such as the CSWA start taking an intersectional approach that recognizes that women of color face not only sexism, but racism as well in their daily lives (note how this direct attack on power structures contrasts with "multiculturalism"). Labels: diversity , race , racism , sexism , Why So Few? The astronomy community has been reeling this past week from the aftermath of the Rosetta #ShirtStorm incident. The scientist who made this mistake has apologized -- which is very difficult to do -- and I applaud him for doing that. Even people with the best intentions mess up and make mistakes; it is a great opportunity to reflect and learn. Here is a video by Franchesca Ramsey on how to apologize when you've been called out. She uses an example from her own life where she was transphobic, got called out, and how she responded. Choo choo! I am full STEAM ahead on the STEM + art/design train. This past Saturday, at our 2nd annual Girls do Hack Day at the Adler Planetarium, I saw first-hand how well it works to use the creativity and fun of art/design to hook girls into STEM. This post was originally published by STEM Women. Two years ago I made the transition from academic science to data science. There are many aspects of industry that mesh better with my working style. However one very important industry practice that I feel is lacking in academia (at least for many of the people I have spoken to) are mechanisms for regular evaluation and feedback — especially for graduate students and postdocs. Lately I've been facilitating workshops on the Impostor Syndrome and having many conversations with people about my process of dealing with and overcoming my own impostor feelings. For me a huge problem with my experience in graduate school was a constant nagging fear that I wasn't performing at an adequate level. There are so few metrics by which to measure success; if I didn't published N papers, make any major discoveries, or win any prizes or grants — how was I to know if I was ‘cutting it?’ And even if I did accomplish some of these milestones, there were always stories of other people who did it more, better, and faster. This was the perfect breeding ground for my impostor thoughts. For a brief discussion of the possible relevance of this to Sappho click here. Today's guest blogger is Stuart Dean. Stuart has a B.A. (Tulane, 1976) and J.D. (Cornell, 1995) and is currently an independent researcher and writer living in New York City. Previously he worked in a variety of other capacities, including 15 years as a corporate attorney. Line final ‘sun’ followed by line final ‘moon’ is in effect a ‘visual rhyme,’ implying a scan of the evening sky, looking west then east, with the knowledge that the moon reflects the sun’s light. Her characterization of the moon as ‘rosyfingered,’ a word otherwise frequently used to describe the sun at dawn, further buttresses the ‘moonlight reflecting sunlight’ reading. Here again, word position is key, only in this case within a single line. Line initial ‘evening star’ and line final ‘dawn star’ implies an underlying unity. It is thus possible that what Sappho evinces here is her recognition that the two stars are the same celestial object (Venus) and that she is referring to the 584-day cycle of Venus. The Women in Astronomy blog is committed to representing diverse perspectives on women in astronomy. The below post is a response from the AAS Committee on the Status for Women in Astronomy (CSWA) reaching out to AAS Working Group for LGBTIQ Equality (WGLE) for guest contributions, specifically contributions from the LBGQTI perspective. If you are interested in contributing a guest post to this blog, please contact Jessica Kirkpatrick. Today's guest post is by Dr. Jane Rigby. 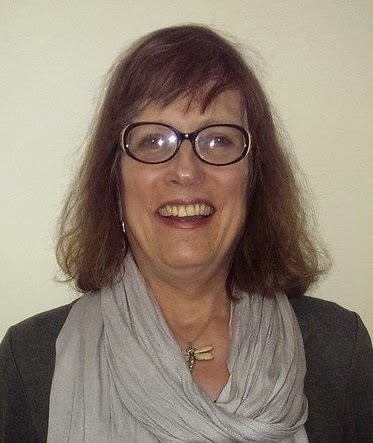 Jane Rigby is an astrophysicist at the NASA Goddard Space Flight Center, a contributor to Astrobetter, and a member of the AAS’s Working Group for LGBTIQ Equality (WGLE). The other day after work, my wife and I were sprawled on the playroom floor, watching our toddler run in circles. I picked a strewn section of the paper and scanned this article. Confused, I read it more carefully. Was this news? I could have titled the article “Man gets chores, work done”? Why was it leading the local section? To me, the most interesting facet of the article was that the attorney had deliberately chosen a lower-paying job with reasonable hours and a short commute. The rest -- “He cooks! He does laundry!” seemed so quotidian. I was boiling water for pasta, and planned to do laundry after the kid’s bedtime. Is it still newsworthy to profile a straight couple that shares household duties? 4. I'm a female engineer, and I love science. Stop calling me a geek. 6. The End of Science Sexism? 9. 2015 PhysTEC Conference Save the date! There's so much to write about this week on the topic of gender equity, I hardly know where to start. I'll back up two weeks to when a well-known male supporter of women in science wrote me and several others on behalf of a male colleague in the UK who sought advice on how to improve the representation of women and minorities in physics departments. He was frustrated that his colleagues didn't understand the problem and were resistant to change, and wondered how some US departments had made real progress. This opened a fascinating small-group email discussion about what works and what doesn't work. Despite the important efforts to make academic culture change a science, it is still primarily an art, and the conversation arising in the network of practitioners feels to me like the gathering of Impressionist painters whose creativity was rejected by the Salon de Paris. We share tips and hone arguments in a creative online atelier before presenting our works in exhibitions. We need our own Salons for mutual support and exchange of ideas - Salons that explicitly welcome men to become full partners in advancing gender equity. Having been asked many times why and how I became an advocate for diversity, I would like to share a secret: people asked me to do it. Female graduate students and faculty told me this was important. But that was not enough; I doubt there are any men in science who have not heard someone say that diversity and inclusion are important. The real clincher for me was what they said next: "We think you can make a difference, we expect you to make a difference, and we will help you." I was being held accountable. If I wanted to succeed as a leader, I had to make this a priority. To the men in the audience: you can make a difference, your colleagues want you to make a difference, and our new Salons (starting with CSWA) will help you. Listen to women, to minorities, and to others unlike you. Recognize that their experiences are as varied as the experiences of white men, so don't overgeneralize. And certainly don't conclude that gender equity has been achieved just because some people think Academic Science isn't Sexist. Others (including us at CSWA) disagree for good reasons. Read. Good starting points are Why So Slow? by Virginia Valian and Why So Few? by the American Association of University Women. 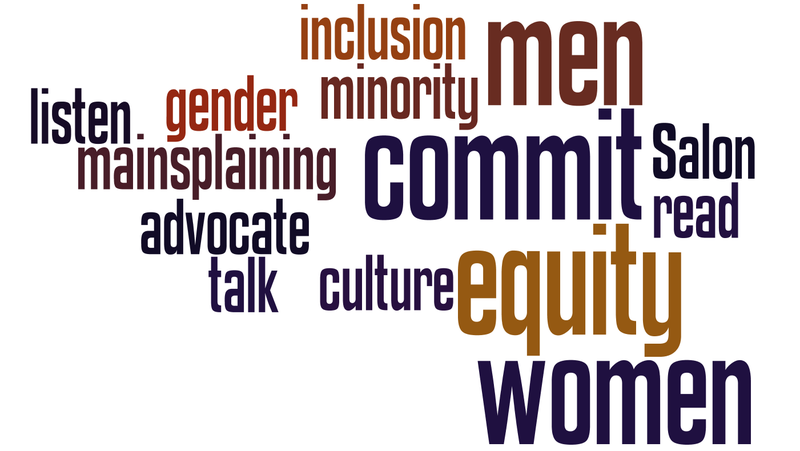 Talk with other men and women committed to equity and inclusion. You'll find some of them at this blog. It's important that we realize that gender equity is not a women's issue, and racial equity is not a minority issue. It's an issue for those in leadership positions, who in most of our fields are overwhelmingly white male. Commit to making a difference. Join one of our Salons, for example the Association for Women in Science. Several years ago I timidly asked the AWIS Executive Director if I could join despite being a man. 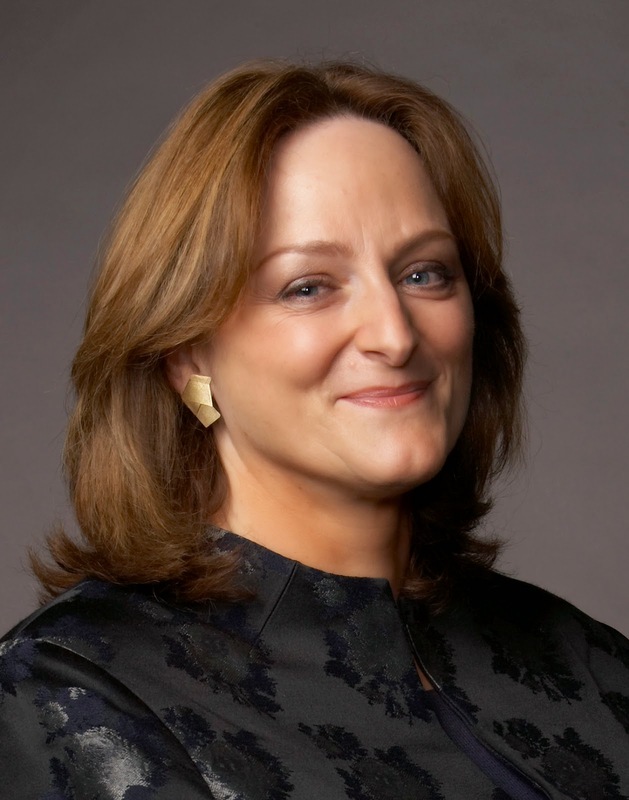 The AWIS President replied, "We are an association FOR women in science not OF women in science and we welcome all members who want to support our mission." I couldn't agree more, and have long since dropped my timidity. AWIS has helped me enormously to learn and grow as a leader. Never doubt that a small group of thoughtful, committed citizens can change the world. (r) Indeed, it's the only thing that ever has. Labels: gender equity , Why So Few? , Why So Slow? 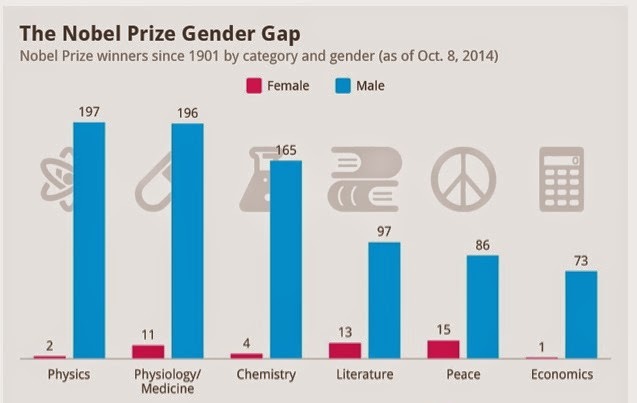 The number of women who have received Nobel prizes in all fields is shockingly low, particularly in physics where the only two prizes ever awarded were Marie Curie in 1903 and Maria Goeppert Mayer in 1963. There have been no physics Nobel prizes in 50 years! I recently read an interesting article on the statistics and possible reasons written by Matt Petronzio in US & World on-line. Before discussing reasons, let's look at the facts. The figure below shows the number of women and men receiving the Nobel prize in the various categories between 1901 and 2014. The ratio of men to women is amazingly small, ranging from 1% in physics to 17% in peace. In physics, this can be compared to about 20% women receiving undergraduate and graduate degrees. Negative stereotypes about women’s and girls’ abilities in STEM persist despite considerable gains in the last few decades. Stereotype threat is related to the anxiety women face in a situation where they have the potential to confirm a negative stereotype about women as a group. Two common stereotypes are prevalent in society and form the foundation for the threat condition: (1) girls are not as good as boys in STEM; and (2) scientific work is better suited to men than to women. As early as elementary school, kids are aware of these stereotypes and can express stereotypical beliefs about which STEM courses are suitable for girls and boys (Farenga & Joyce 1999; Ambady et al. 2001). Girls and young women are aware of, and negatively affected by, the stereotypical image of a scientist as a man. Although largely unspoken, negative stereotypes about women and girls in STEM are very much alive (Buck et al. 2008). A large body of experimental research has found that negative stereotypes affect women’s and girls’ performance and aspirations in STEM. Even girls who strongly identify with math - who think that they are good at math and being good in math is important to them - are susceptible to the effects (Nguyen & Ryan 2008). Stereotype threat may help explain this discrepancy: girls get higher grades in STEM classes but lower scores on high-stakes tests like the math SAT and AP calculus exam. Stereotype threat may also help explain why fewer girls express interest in careers in mathematically demanding fields. Girls may be trying to reduce the likelihood that they will be judged through the lens of negative stereotypes by avoiding these fields all together. My colleague John Johnson recently recommended the book Seeing White: An Introduction to White Privilege and Race and asked that I read it so that we could have a more informed discussion as we work together over the coming years. I confessed to him at that time that I hadn't read a book in a long time (and I am now confessing the same to you, dear Reader), but that I would try. Well, I am happy to report that I am now halfway through. The last chapter I read described different frameworks in which to understand discussions of race and privilege, and I was particularly struck by the discussion of one such framework, namely that of Multiculturalism. In the book's definition of Multiculturalism, a multiculturalist would express understanding for different groups, celebrate an appreciation of these differences, seek to ensure diversity in their community, and advocate respect for individuals in these different groups. Perhaps many of you might be thinking: That certainly sounds pretty good! Respect, understanding, and diversity are all very progressive words. I might even go further and argue that many members of our astronomy community strive to achieve these goals. So, what's missing from this picture? When I joined the CSWA last year, I had dinner in Cambridge with a number of fellow CSWA members who were in the area at the time. At one point we went around the table giving our reasons for serving on the committee. I stated that my motivation was the help people of color, particularly women of color. I found the success of the CSWA and the advances of (white) women in astronomy extremely inspiring and I wanted to learn better how they had moved from being minorities to having a more equal representation in astronomy. The CSWA Chair recently told me that if I wanted to take on the subject of race and the issues facing women of color, that rather than expecting the committee's full support for this "specialized" issue, I should go ahead and lead the way. With this post, and my previous post, I endeavor to bring the issues facing of women of color in our community into better focus, with the hope that the rest of the committee might see this as a problem worth addressing. After all, if white women made up < 5% of the astronomy community, I think there would be widespread calls for action. To focus on a specific population, Black women make up about 1% of the astro community, and 0% of faculty hires over the past 10 years. The situation for Latina and Native women isn't much better (See Donna Nelson's statistics for top-40 astro depts as of 2007). In fact, the situation is even dire for Asian American women, broadly speaking. On my personal blog I have given understanding of racism in America, and how I teach the concept to my children. The reading list posted therein informs much of what follows, so if you’d like references please see the end of that article. See also my introduction on the subject of race in (US) astronomy. For people wishing to comment on this, please do me, yourself and the community a favor and first read this excellent reader’s guide on discussing racism. You’ll be surprised how often the first thing that comes to your mind has been previously voiced and repeated ad nauseam elsewhere in similar forums, if not on the floor of the US Senate back in 1964 during debates over the Civil Rights Act. When in doubt, please frame your comment as a question, and remember that as an educated individual you are not entitled to your opinion. 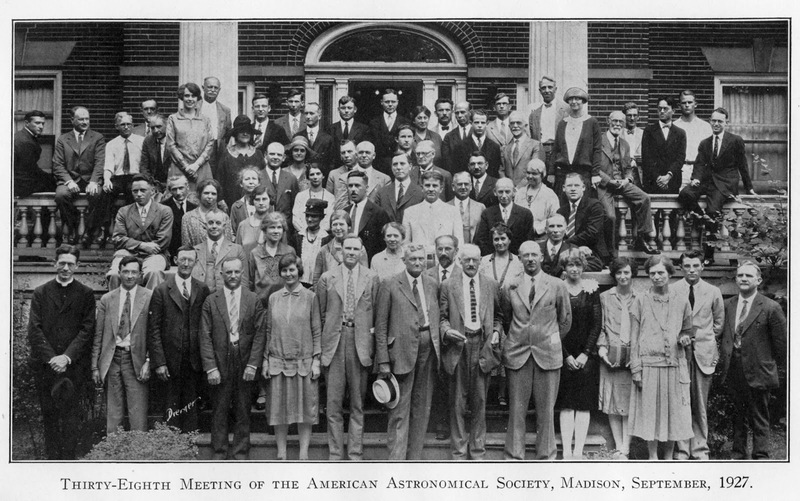 The 1927 AAS meeting. In one key respect it is the same now as it was then. Race has little to no biological basis. Many lines of genetic research have shown that when humans are divided into various "classical" racial categories (a process that is, itself, fraught with difficulty and ambiguity), that 85% of genetic variation occurs within racial groups, while < 7% of the variability is across racial divisions. At a genetic level, we are an order of magnitude more human than we are any specific race. While race is not a biological reality, it is very much real because we humans believe in race and act according to racial divisions. This started with the US Census, which needed to identify Black slaves in the South so they could be counted as 3/5 of a human each for congressional representation. It continued as a justification for slavery (slaves are happier when taken care of by white owners!) with the oppressive Jim Crow laws, legal segregation, as well as federal appropriation of funds, employment and military service. It also formed the primary basis of the problematic eugenics movement, and eugenics researchers produced most of the junk "science" that informs even modern conceptions of race. Race divisions continue today in the wealth gap, imprisonment disparities, school segregation, etc. The key takeaway is: race, while not a biological reality, is a social reality with numerous and far-reaching consequences for how we live and interact in American society. Race is real, but only because we have created it, defined it, nurtured it and most importantly: used it.